In saw this opportunity at a local hotel. 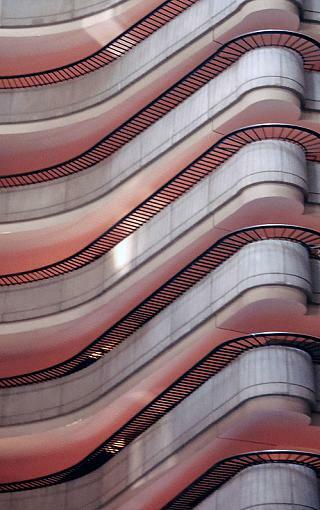 I was attracted to the repetition, the lines and curves. In worked with colors for a pleasing quality. Otherwise, it is a worthy subject but I am not sure on the lighting and resulting color; seems to be a bit flat? It is also soft on my monitor, and I think such a shot should be razor sharp since you had unlimited time to compose and set up (on tripod). Maybe you can sharpen it up a bit in post..